The president introduced leader of Crimean Tatar people Mustafa Dzhemile. 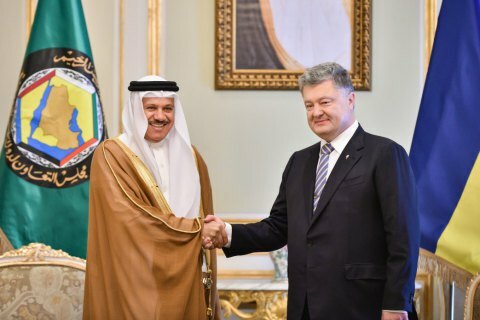 In the course of the official visit to the Kingdom of Saudi Arabia on 1 November, Ukraine's President Petro Poroshenko met with Secretary General of the Cooperation Council for the Arab States of the Gulf Abdullatif bin Rashid Al Zayani. The parties discussed prospective sectors of cooperation development between Ukraine and the states of the Arabian Peninsula. The president introduced leader of Crimean Tatar people Mustafa Dzhemilev and urged the Cooperation Council for the Arab States of the Gulf to step up protection of the rights of Crimean Tatars in Crimea occupied by Russia. A specific subject at the talks was also the actual issues of the current political and security situation in the Middle East, including in Qatar, Syria and Yemen. The parties condemned the terrorist attack in New York and stressed the need to combine efforts in the fight against terrorism, which has no borders, in all its manifestations and forms. Following the meeting, the Memorandum of Understanding on the mechanism of consultations between the Ministry of Foreign Affairs of Ukraine and the Secretariat General of the Cooperation Council for the Arab States of the Gulf was signed.